The most amazing thing happened last week.An 11-year-old girl tagged along to what she thought would be a boring tech event, and came out of it talking nonstop about math and how amazing it was. The girl was my daughter, Bella. Math is a subject she’s struggled with. She has worked very hard at it, but it doesn’t come easily. She recently shared with me that someone told her she ultimately wouldn’t even use most of the math she is learning. So when I asked her if she wanted to go to a local tech event with me, I had no idea what to expect. What happened at Co-Merge downtown Wednesday night was a parent’s greatest wish come true. Geek Girl brought together some of San Diego’s top women in startups to spread the message of the strength of women in technology. Women from local startups to investors told how they got into technology and shared how other women can succeed in technology. The panel of women included moderator Shawn Bridgeman of Embarke, Liz Hedstrom co-founder and creator of WeddingHappy, Marnie Zoglman senior software operations manager at Qualcomm, Juliet Oberding, co-founder of Predictably Well and Allison Long Pettine, president of Crescent Ridge Partners Ventures – a great mix of executives, software developers and investors talking about how they got to where they’re at. 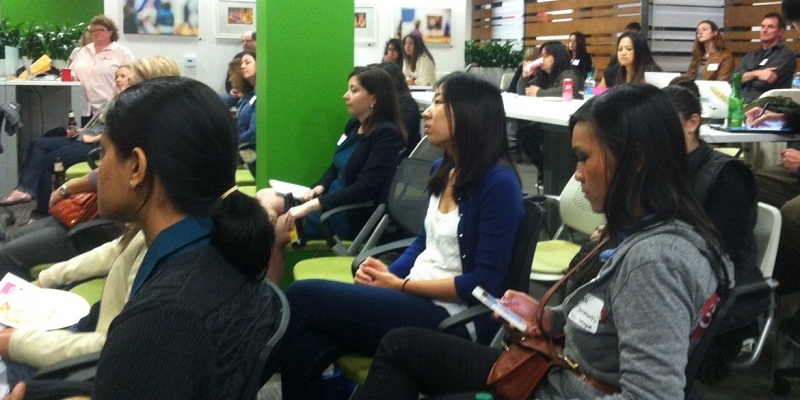 San Diego is becoming a great place for tech and startups and women are a big part of it. The Geek Girl event focused on the so-called pipeline issue – getting girls and women involved in technology at a young age. Women earn more than half of all bachelor’s and master’s degrees, but only start 3 percent of new tech companies. Women, therefore, represent a nearly untapped potential when it comes to creating new tech businesses and contributing to a vibrant tech startup scene. Several women at the event said women sometimes shy away from developing the tech knowledge critical to establishing a business and even fewer pursue tech as a business concept. “A manager of mine looked at me and said, ‘you’re ready to be a manager’ and that was the push I needed,” said Zoglman. Geek Girl and Fishlock have been trying to be part of that push locally. So has Chic CEO, founded in San Diego by Stephanie Burns, a free online resource for current and aspiring female entrepreneurs. It provides women with the ground-level information they need to start a business. And, women in startups hit the same walls as everyone else, namely funding. Another one of the speakers, Pettine, is trying to provide it for San Diego-based startups. “Six out of seven of my startup portfolio are San Diego companies,” she said. Several of the executives at those companies are women, and Pettine is an important part of San Diego’s startup growth. But, before there can be funding, there has to be an idea. Oberding suggested a few ways to spur girls’ interest, including a hack-a-thon where they could build their first app.